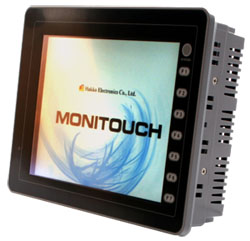 Hakko Monitouch V806 (5.7") touch screens are available in low cost mono, STN or TFT models. They are also available with or without ethernet. This ensures that we can offer the most economical model for your project; adding the flexibility that you need, without adding cost. They are the smallest touch screen available in the range. Larger screens upto 15" are available. The Monitouch V806 provides a convienient way to collect, display and send data from a wide range of PLC's, controllers and variable speed drives. Hakko do not manufacture peripheral devices, so they are collaborative in communicating with an extremely wide range of other manufacturers products. Monitouch has an incredibly long list of compatible device drivers that can be used together to form a data gathering network without the limitations of working with a single manufacturer. Data can be gathered from one PLC, stored, displayed and shared with other devices in the network. All of the above variations of V806 are configured using a PC software application called V-SFT5, which provides drivers, ready built libraries of graphics for graphics to display data, graphs, trends, lamps, buttons and switches. In fact you can create any graphical image and turn it into a switch that will interact directly with your PLC or any other device on your network. 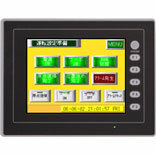 Powerful, well connected and easy to use, these intelligent screens allow you to design custom screens with simple instructions for your operators while performing complex production tasks in the background. The V806 is limited when it comes to screen size. If you have lots of data to display on your SCADA application, we highly recommend that you select one of the larger screens, which will help both designers and users of SCADA applications. 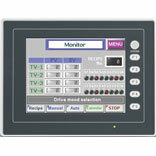 For more information on other sizes of Monitouch HMI's please follow these links. 7", 8", 10", 12" and 15". This list is being updated on a regular basis. The remote capabilities of Monitouch HMIs gives access to the troubleshooting data that engineers need to fix the problem fast. 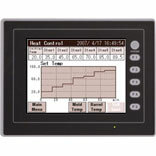 That is data from the entire process, not just the HMI & PLC, but all devices connected to the Monitouch, devices such as PLCs, Drives, Temperature Controllers and more. Information from the manufacturing process can be passed to other business processes using Monitouch's MES functionality. Bridging the gap between your business management system, SCADA package or custom software application. From production reports & labels to printing barcodes, Monitouch HMIs allow for the most flexible printing functionality in the industry. Monitouch HMI's provide configuration tools that make life easy when delivering bespoke application solutions. In addition to a large library of standard graphical, trend and graph functions, the V806 series of touch screens provides a efficient macro language that helps you to quickly develop smart tasks to operater or data events. 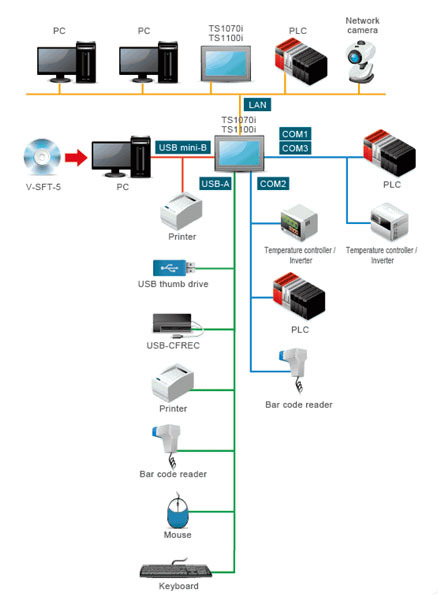 Flexibility to connect multiple protocol devices such as PLC and temperature controllers. Flexibility to bridge data between multiple protocols. Getting connected with Monitouch HMI allows you to design control systems without limitations, utilising an industrially hardened, real time HMI. 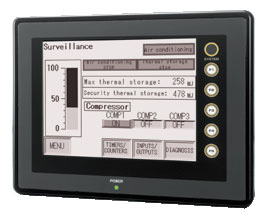 Data can be logged from any memory location within the Monitouch HMI or from any device connected to it. This provides a fast and secure way to process data from production machines or process environments. Data can be stored on removable data cards, USB sticks or transmitted over the ethernet using FTP and Web server technology. Up to eight (8) individual manufacturer 's communication protocols can be used at any one time, enabling data to be collated, stored and passed to all parts of your system. Data can be read, logged, transferred and published from individual devices, or to web pages and database servers running MES or other SQL data stores. Many customers contact us looking for replacement items for V606 (Version 6 Hakko Monitouch) decvices. If you need assistance in identifying your V606 or if you would like help in identifying the latest model for your application, contact us by phone, by email or via our enquory page and we will do our utmost to help you. Equivalent Fuji Electric UG touch panels are available from us in the UK under the name of "Hakko Monitouch". If you are looking for a replacement screen, please note that the hardware is exactly the same. However the program on the Fuji unit has to be converted to work on the Hakko Monitouch unit. This conversion can be easily performed using the V-SFT software. For more information please contact us.